because I actually cooked dinner last night! I'm quite proud of myself and after enjoying the leftovers for lunch I thought I would share. Yesterday I spent a couple minutes drooling over the yummy meals on Smitten Kitchen (again) and ran across a "Lemony Zucchini Goat Cheese Pizza" recipe that I was intrigued by. 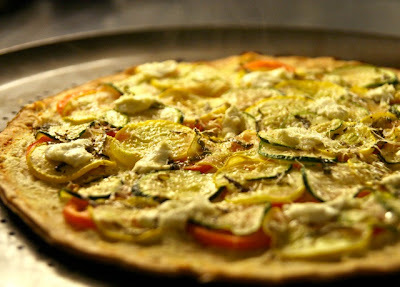 I set out to make my own squash pizza- sans "lemony" plus tomato and parmigiana reggiano. It was delish if I do say so myself. Don't tell anyone, but I'm thinking about trying to cook at least once a week. Be scared! I saw this when she posted it (a couple months ago, maybe?) and it looked sooooo good. I want to eat it. I should just make one myself.